Integra Tower, a Prestigious 39 Storey Grade A, LEED Platinum Certification and MSC Cybercentre Status Corporate Office Building is part of The Intermark Development. Integra Tower is located strategically at the main juction of Jalan Tun Razak and Jalan Ampang, the two main arteries of Kuala Lumpur city traffic. 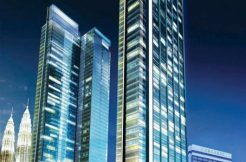 As part of the KLCC area and within the KL City Golden Triangle,The Intermark is a landmark commercial development that one should not miss when looking for a prestigious office address. It is easily accessible via public transport since the nearest LRT station (Ampang Park LRT station), and buses and taxis are within walking distance from the building. Boasting one of the largest floor plates in the area, and green building features, Integra Tower offers a balance of functionality, sustainability, and connectivity. With a total net floor area of approximately 736,000 square feet, Integra Tower will have one of the largest floor plates in the Golden Triangle – approximately 25,000 square feet per floor. The excellent core to window depth allows for flexible space planning while its raised floor system enables efficient cabling. It is doubt as the one of the Most Premium Office in Malaysia with the Rental Rate of RM 13.00 per sq.ft. Integra Tower offers MSC office space for rent in Kuala Lumpur.